Captured off the computer screen this morning, the home page of the Springfield Museum, Springfield, Massachusetts, where a most wonderful exhibition - "Leaving Our Mark: In Celebration of the Pencil" - will open in November and run through the winter months. 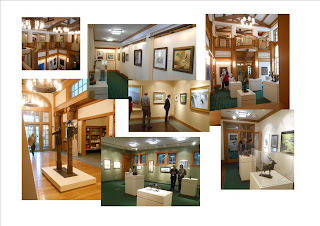 I am most honored to have five of my works included in the exhibition along with outstanding examples from the other featured artists - Lesley Cohen, Lisa Henry, Ryan Jacque, Christina Mastrangelo, Scott Tulay, and Steve Wilda (Massachusetts), and Paul Batch, Doug Gillette, Luciana Heineman, Bill Simpson, and Alan Spellman (Connecticut). The exhibit will also feature works by Jennifer Maestre and Dalton Ghetti, who both use pencils to create imaginative and intricate contemporary sculptures. 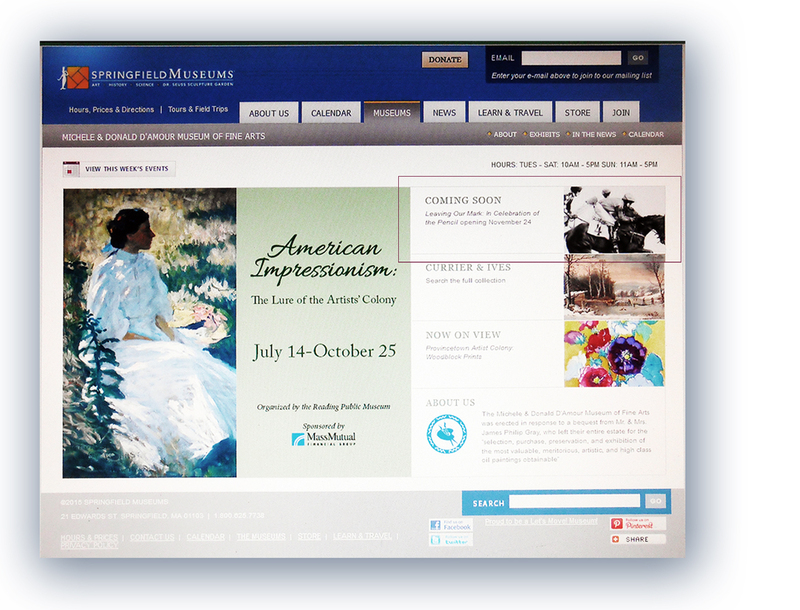 The museum has spotlighted my work, "A Race to the Finish" on their banner intro to the exhibition and I was quite surprised to find it so. Thanks to Steve Wilda, who organized this endeavor with the museum, and asked me to be a part of it. In just shy of two months, this year's edition of the long-running Waterfowl Festival on Maryland's beautiful eastern shore, will open. I believe this will be my 25th year of doing the large, group show and the next few weeks are going to be busy ones in the studio as I prepare new work. This is one of the recently completed works that will head to Easton, MD in mid November. It's always a beautiful, fall weekend in Easton with lots of great art and sculpture and carvings and much more to see and enjoy. Well worth a trip across the Chesapeake Bay. The show opens to the public on November 13th, with a benefactor gala on the evening of November 12th. Check out their web site to find out more. With an ever so slight nod toward 1967's The Dirty Dozen, today, a week after my departure to this year's edition of The Woodson Art Museum's annual much anticiapted event that is Birds in Art, I'll spend a bit of time spotlighting two dozen of my favorite works from this year's exhibition in The Delightful Dozen x's 2. As those of you who have looked in on this pretty annual posting know, I could easily post and spotlight and speak to each and every one of the works included in the exhibition, but alas, time will not allow that and so I have skimmed the cream off and picked these two dozen works to feature, while in no way diminishing the beauty, appeal and mastery of those works not mentioned here. 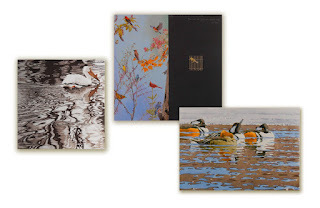 If you really want to see what Birds in Art is all about, you can order a catalog here or better yet, plan a visit to The Woodson Art Museum to see the exhibition in person - a far, far better viewing! So then, in no particular order, here follows two dozen inspiring works of art that captured my eye as I saw the exhibition for the first time last Thursday evening. Having drawn them myself, many times in the last few years, I am rather drawn to chickens when I spot them and was amused and delighted to see many works included in this year's Birds in Art which spotlighted the jocular bird. 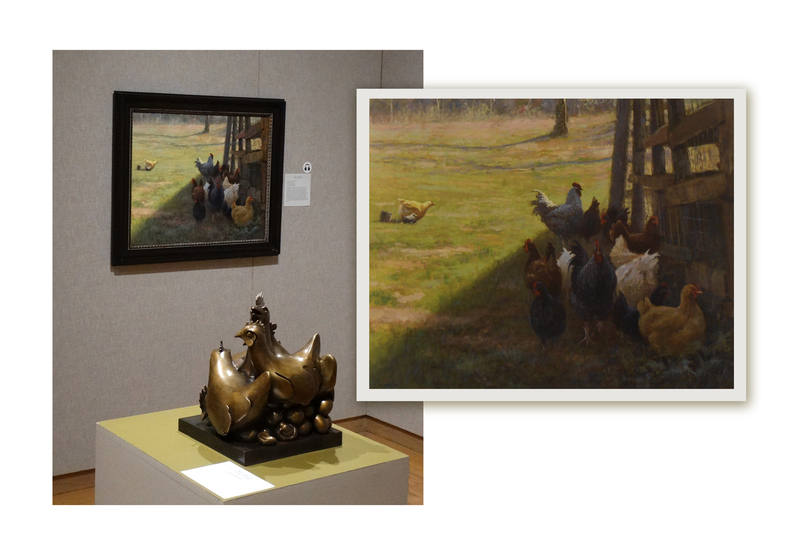 Two portrayals that really stopped me were a painting by Virginia's Ed Hatch (No Chicks Allowed), a first timer in the exhibition this year, and a most smile-producing bronze (The Barnyard Brigade) by California's Burt Brent. What a great pair of works these made in one corner of one of the galleries, nice planning on the part of the exhibition team at the museum. Hatch's work really brought me into the interesting composition, placing the major features and subjects off center (as I do many times in my drawings) while maintaining an appropriate balance across the entire canvas between strong light and deep shadow. The cluster of chickens all tangled up in Hatch's work was quite nicely duplicated and echoed in Brent's fine, humorous bronze sculpture almost as if both artists had planned out corresponding strategies of what to do and how they might relate. I generally approach my own work in a somewhat graphic manner, looking at qualities of shape and texture, value contrasts and abstracted forms, and trying to develop interesting figurative compositions within those parameters so I'm naturally drawn to works that embody similar attributes. 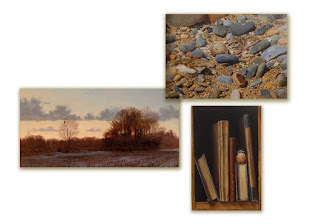 In the next three works, spotlighted below, three very diverse artists in three very diverse mediums have developed very graphic works with high appeal, interest, and stories to tell. Beginning on the left, Sherri York's Cruisin', a reduction linocut, displays her mastery of the medium to its best. I love the way she has positioned the pelican way off center and yet by putting so much emphasis on the swirling patterns of reflection in the water, she has kept a balance across the composition which contrasts the movement of the pelican away from the center. Deftly handled, it is a compositional framework not for the weak at heart; confidence in yourself and your abilities is surely needed and York has it in spades. In the center is Mark Eberhard's Man Loved the Birds, a striking oil. Mark's very graphic portrayals always inspire me and make me pause to both understand the story being told as well as to relish his beautiful renderings of the natural world and how he manages to illicit an emotional connection in this viewer, and I am sure in all others who stand before his canvases. 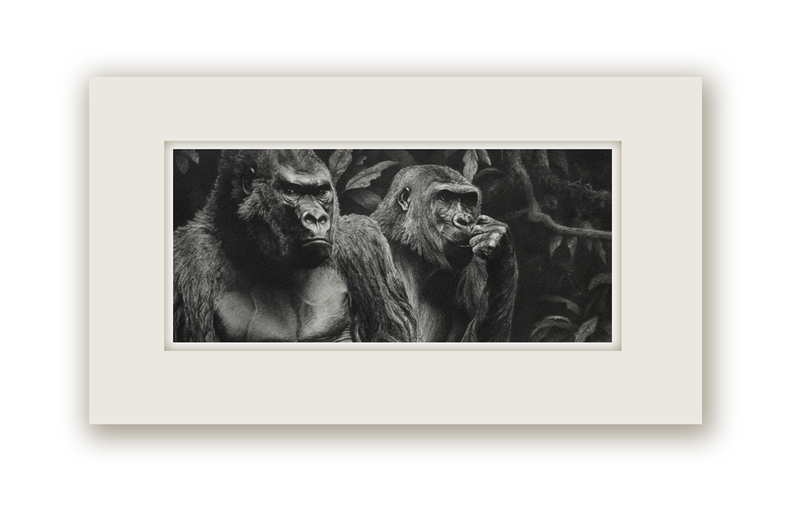 The final work in this trio (Romance in the Hood) by last year's honored Master Wildlife Artist, Barry Van Dusen, embodies some of the same qualities that both previously discussed works do, but in a beautifully rendered watercolor. Though a completely different medium to York's, there surely is a similar character to Van Dusen's brush work and strong color separations that give it a sharp graphic reading, which is closer also to the more defined details in Eberhard's oil. Three very distinct works of art, each holding their own as far as design and execution, yet embodying similar characteristics that make them almost appear as if having come from the same hand. 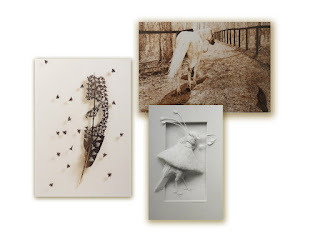 Playing Hide and Seek is what comes to my mind when viewing the three works, above, that make up the next trio. Once again, the 'hide and then seek' idea of composition is one that I often make use of, either by intentionally burying the main subject or a surprise second or third subject, which when 'discovered' will bring a smile, or simply making the animal subject fit into its habitat as it would in nature; a part of the overall scene and one often overlooked or missed in a hurried passing. These three artists have played the 'game' well and brushed very appealing, smile provoking works. First, on the left, Jim Bortz's Twilight Watch shows us a glorious landscape in which his great horned owl resides. His depiction of light and color and atmosphere just after the sun has dropped is a marvelous rendering that immediately brought to my mind, many personal experiences and made an immediate emotional connection. The position of the distant owl, though relatively insignificant in the broader landscape, is the key that moved my eye right into the painting and completely documented that sort of surprise moment in nature when such an observation might naturally occur. In the upper work of the three, English artist Robert Cook deftly hides his ringed plovers Amongst the Pebbles just as they would in nature - camouflaged and still, blending in with their beautifully rendered surroundings in oil. A perfect example of hiding and seeking which obviously appealed to the museum's acquisition committee as this work will be added to their permanent collection. Jhenna Quinn Lewis, in her second inclusion in Birds in Art, brushed a beautiful oil in The Ornithologist's Library. Her red breasted nuthatch is not completely hidden, but still makes for a very appealing, surprising addition to the book shelf. The spare coloring and composition emphasize the details of books and bird that need emphasizing while leaving out any fussiness that would detract from what is important in the overall design. Straight forward portraits, to my eye, can sometimes be rather boring and devoid of interest or, when handled with more finesse, starkly appealing and captivating as in the three works seen above. In the upper left, Australia's Tony Pridham has painted a beautiful trio of corellas, a kind of cockatoo. They perch upon a twisty branch, illuminated with sharp light and shadow and against a softly developed sky that glows blue and pink. It is the deft rendering of the birds and branches and the color values in the birds that made this a show stopper for me. The compositional elements are few and rather simple in shape, but what set this painting apart from many others, to my eye, was the mastery involved in making those spare elements burst off the canvas. It is no doubt why this painting captivated the jury to such an extent as to have been included in this year's exhibition. Below Tony's work is another beautiful portrait of a Tricolored Heron in pastel by Texan, James Offeman. I was drawn into that work because of the stark value shifts in the bird and the dark, negative space of the background. The highlights on the bird were deftly handled and gave the work a very strong depth and spatial atmosphere in which to 'live'. One of the more simpler works included in the exhibition, it held its own amid all the more complex compositions in my estimation. The final work of this trio by Brian Jarvi (Silent Song: The Birds), was actually a large color study for one panel, according to the artist, of a larger, more complex work of African subjects that he has embarked upon and will consume his work time over the next year. The rendering of all the specific birds not only was spot on, but his interesting arrangement of all is what really sparked my intense study of the oil. Though a rather monochromatic guy myself, I tend to be drawn toward the luminous in color work; those works that radiate sparkle and spotlight strong value shifts. Luminosity - the quality of being intellectually brilliant, enlightened or inspired - could also be applied to the three works I've spotlighted below. To the left, first timer Jeffrey Larson, a 'local boy' being from Wisconsin, knocked my socks off, and those of many other of the attending artists with his Rooster Pheasant in most glorious and lush tones of oil. Reproduction color here and in the catalog just could not capture the true intensity and luminous quality to the sharp turquoise tones of the door and the contrasting warm feathering of the bird. The dimensional quality of his depiction was also outstanding and from across the gallery appeared to have a third dimension. How wonderful to have found such a marvelous painting included in the exhibition as a first time inclusion. The upper work to the right, depicting crimson-fronted parakeets in Shadowplay by Debby Kaspari, also embodied some of that luminous quality with striking sunlight and sharp contrasting shadow. I also enjoyed the very angular composition. The third work below, a marvelous wood carving by another Wisconsin resident, Todd Wohlt of Blue-breasted Bee-eaters, certainly fit my understanding of the definition of luminosity as being brilliant, enlightened or inspired in the way that Wohlt's birds emerge from the wood as if by magic; their coloration developing as they take form and shape and moving across from block to branch. His depiction of the bee-eaters very high contrast color was also spot on. 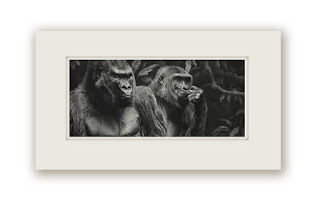 Having observed these little flitters in person on my many trips to Africa, I certainly was able to make a very strong emotional connection with the work. It is hard for me, as noted above being a rather monochromatic guy myself, to not be drawn toward the more monochromatic works included in the exhibition each year and this year there were several marvelous examples of the mastery of black, white and tones of grey to be viewed. I've spotlighted just two of those above. 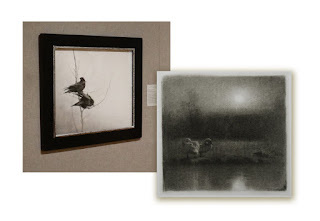 On the left is a fine charcoal work by Ray Brown, Huginn and Muninn (as Ray noted in his text accompanying the work in the catalog, the title derives from the names of the two supposed raven pets or servants to Odin in Norse mythology, their names meaning thought and memory and their task to fly the earth gathering information so Odin could be all knowing). Over and above the uniqueness of the title (something which I often try to succeed in when naming my work) the rendering of the ravens was quite natural and appeared almost as if dashed off in a moment of creative explosion; the movement and poise of each bird so natural in feel. Each of the other simple elements of the composition were placed in perfect harmony with the bold forms of the birds, enhancing and supporting the design yet offering minimal distraction from the importance of the two main subjects. John Felsing, known for his soft, emotive, ethereal landscape paintings, contributed a beautiful graphite work, Blue Acrobats, in his typical hand. A wonderful melding of light and shadow, soft tones and feathery hatching and line work all came together in a very emotion-packed little 15" square package. The next pairing of works, one by 2005's honored Master Wildlife Artist, Nancy Howe and the other by Wyoming's Kathryn Mapes Turner (in her fourth appearance in Birds in Art), bring into focus the 'out-of-focus' quality of their two very distinct styles of painting, which knowing a larger body of work of each of these masterful artists, establishes those approaches to their work as very well known and consistent. In Nancy's work, In Transition on the left, her depiction of the important aspects of the composition, namely the goldfinches, brought just enough resolution and detail to give the birds the importance they required within the bounds of her ethereal and subdued landscape while letting them blend in and meld into the overall soft quality of the color, light and design of the work. In her accompanying text to the painting, she talked about the intentional compositional structure of the work, relating it to the overall design and title and that struck a close chord within me as a fellow creative soul. 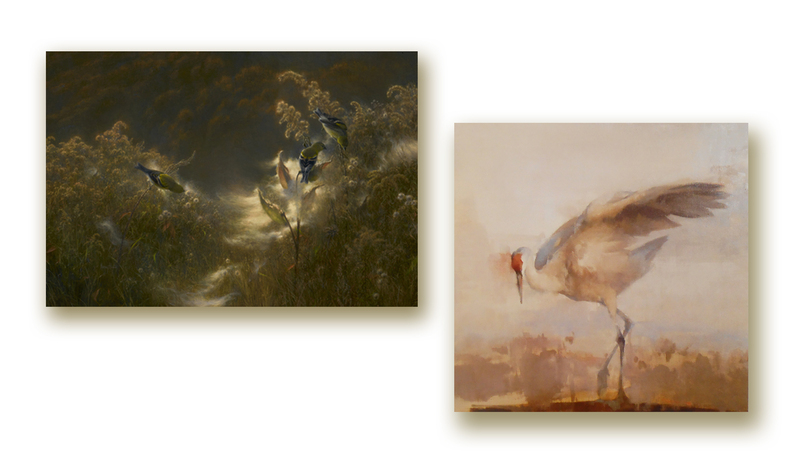 Mapes Turner's Favored, depicting a sandhill crane, embodied many aspects of Howe's approach to painting but in a more spare, concentrated overall design while duplicating a similar, minimal color variation and muted tonal approach to the other oil. Unique in structure and medium, the next three works, spotlighted above, represent those pieces that always catch my eye when wondering into the galleries for the first time each year I have attended the opening of Birds in Art. 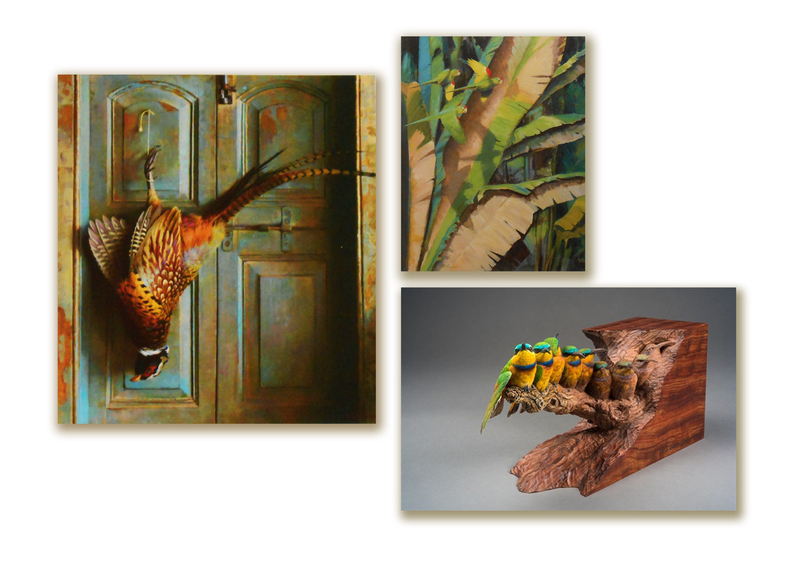 Feathers, cut paper and burned wood, are not usually mediums that one thinks of when thinking about works of fine art, but the three noted here certainly do embody those attributes that make a work a fine piece of art. To the left, Chris Maynard from Washington state, once again proves that he knows how to deftly manipulate such a delicate support medium as an actual feather in his magnificently presented Eat. The tiny, perfectly defined insects emanate from the feather as if by magic, yet through Maynard's precision appear almost as a naturally occurring event. This is the second time I have marveled at his mastery and noted his work in my post-exhibition sum up the last time as well in 2012. The cut paper bird of paradise (perotia sefilata) by Canadian, Calvin Nicholls in his Body Language, was another of those special works that popped off the wall, though comparatively one of the smaller works in the exhibition at just 15" tall. Nicholls' ability to capture movement and depth and body structure with nothing but pieces of white paper, cut and carefully molded and folded, and how light and shadow are employed to also enhance dimension, was mesmerizing to say the least. The final work of this trio by Nabuko Kumasaka from Japan, See You Tomorrow, placed her crow in a most unusual position in the composition, almost falling off the lower right corner, but it worked; the bird's pose and angle mirroring the angle of the fence line and countering the movement and direction of the horse. On top of all that interesting compositional design was the fact that it was all accomplished by burning into a hunk of wood! 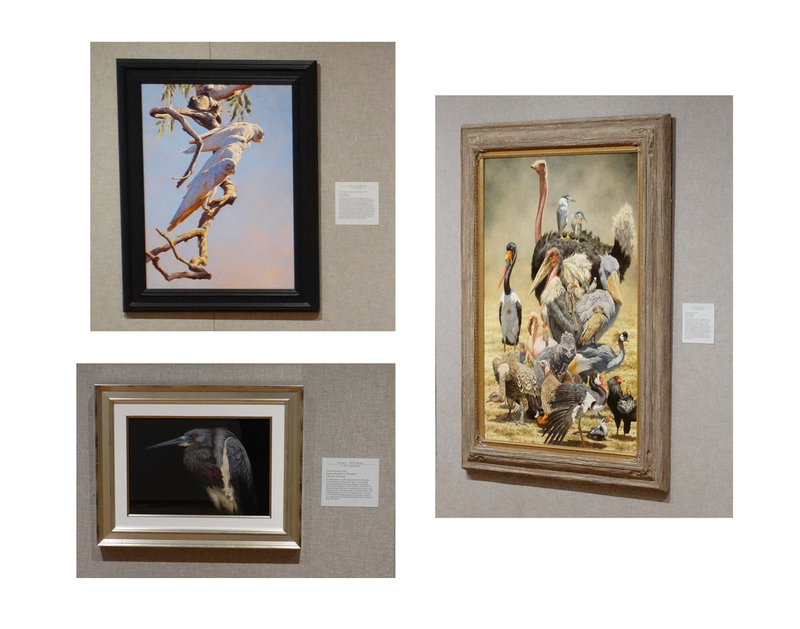 Last, but certainly by no means least, a trio of three dimensional works close out this year's 'arm chair' tour of Birds in Art. Being a 'flat artist', I do not usually have reason to interact with sculptors, though I count sculptors among my circle of artist friends and have learned a lot over the last few years as I interact with and talk to more three dimensional purveyors of creative output. I tend to look at three dimensional works in the same way I look at paintings and other flat works of art - first and foremost drawn into the compositional aspect of the work and its overall design, then to the quality of the handling of the medium. In this final trio of works, I've spotlighted three pieces of dimensional work that rose to the top of my 'likes' in the exhibition. 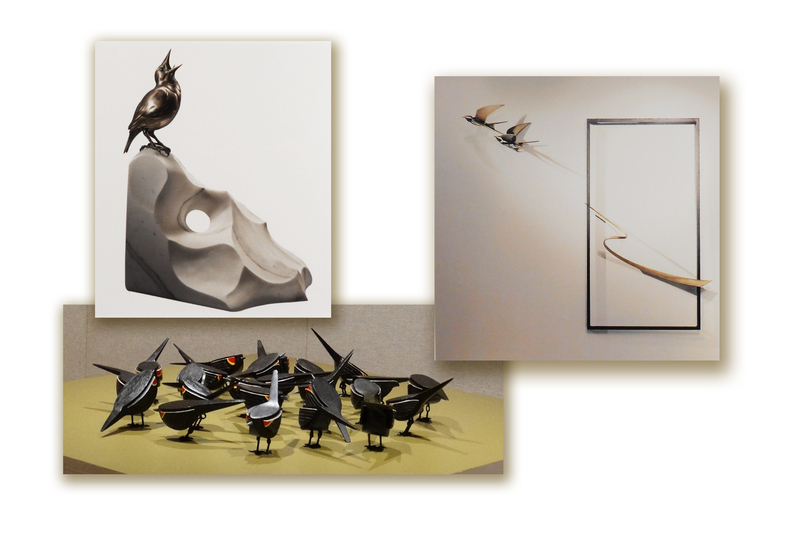 The first work, upper left below, by Washington state resident, Ross Matteson, a bronze and marble meadowlark (Whit's Salt Licks), appealed to me because of the combination of the two materials in the beautifully stylized work. I tend to be drawn toward the more abstract in three dimensional works and Matteson's work had the qualities of both an abstracted vision and a figurative representation of its main subject. Don Rambadt's welded bronze piece, Wings When You Fall, depicting barn swallows swooping away from the rectangle (representing a barn door or window?) surprised me upon entering its gallery as it was hung against the wall; his works usually occupying a pedestal and able to be walked around. Of course, I recognized his unique style but beyond that, was easily pulled into its movement and whimsy. The final three dimensional work by yet another first timer, Ohio's Barry Gunderson (Four and Twenty) made me chuckle as I descended the stairs into the lower gallery space. His polyurethane, painted wood and metal assemblage of red-winged black birds was one of those surprise works that just stop me in my tracks and demand a bit more attention and study. I really enjoyed all the shapes and poses the birds reflected and could almost hear their group chirps and chatters. And so another ramble through some of my favorite works from the event that IS Birds in Art comes to its conclusion. There is a lot of fine, fine work to be seen at The Woodson Art Museum during the course of the next two months before the exhibition will close and about half of the works will then go on tour. That tour will hit the following venues -The Fullerton Arboretum, Fullerton, CA from December 28 through February 22, 2016; The Art Museum of Southeast Texas in Beaumont from March 12 through June 5 of next year; The Museum of the Red River in Idabel, OK from June 24 through August 21; The Newington Cropsey Foundation, Hastings-on-Hudson, NY from September 12 through November 4; and finally to the Dane G. Hansen Memorial Museum in Logan, KS from December 9 through February 5, 2017. It's a long tour this time and sure worth a visit should you be within an easy distance of any of these fine venues over the next 16 months. 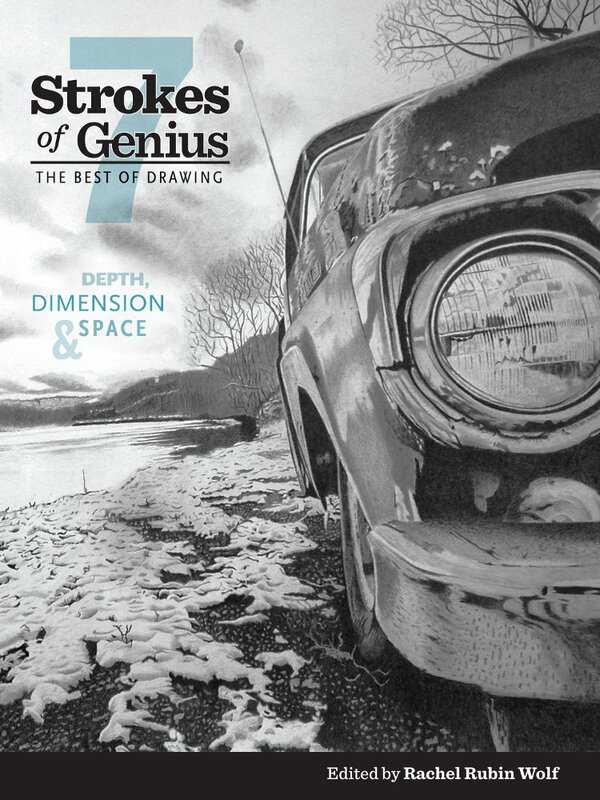 Recently announced by North Light Books, the 7th volume of their ongoing series, Strokes of Genius: The Best of Drawing, will be available in mid November for purchase. One of my drawings is included in this volume, which focuses on Depth, Dimension and Space. It is my 6th time for having work included in this series. As noted in the last entry here, this past weekend saw the opening of the 55th Annual Members' exhibition, Art and the Animal, of the Society of Animal Artists at the Roger Tory Peterson Institute of Natural History in Jamestown, New York. It was a wonderful event at that most elegantly rustic venue with over 200 in attendance at the reception on Friday evening. Art and the Animal will hang in Jamestown through October 25th before half of the exhibition will go on tour to several other venues across the country, perhaps one near you.